TSPEC allows 802.11 wireless client to signal its traffic requirement to the AP. The client includes the TSPEC in the add traffic stream(ADDTS). TSPEC from client include data rate, packet size, number of stream & more. 802.11e standard specifies TSPEC to provide the management link between higher QoS protocols & the channel access function. Channel Access functions are defined by EDCA(Enhanced Distributed Channel Access) mechanism. 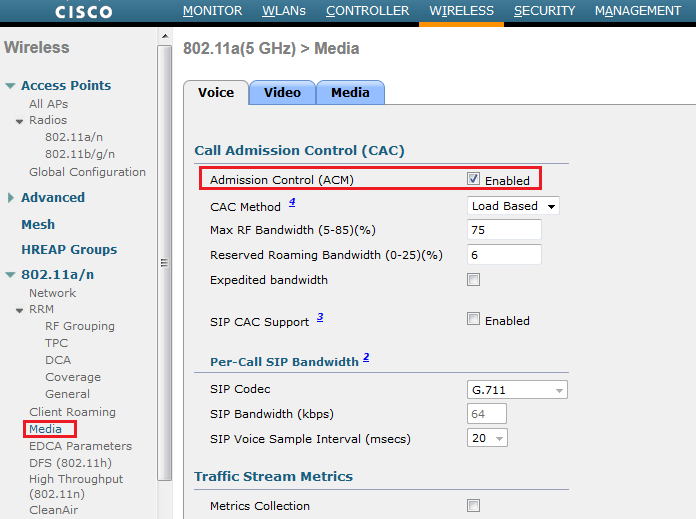 To enable TSPEC on the WLC, you have to enable Call Admission Control (CAC). ADDTS action frame: This happen when client originate a phone call associated to the AP. ADDTS contains TSPEC and might contain traffic stream rate set (TSRS) information element (in CCXv4 clients). 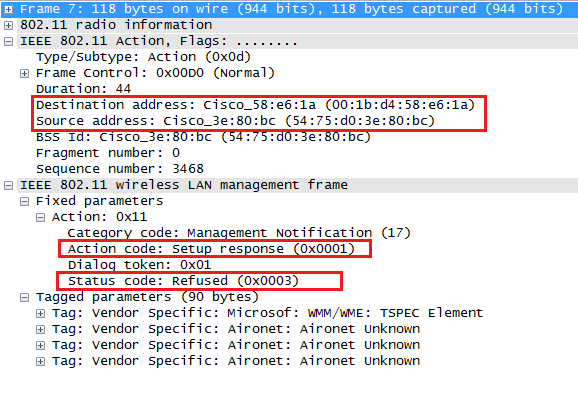 A cisco wireless phone actually performs two ADDTS because codec used in the call is not known before the RTP stream is established. Association & Re-association message:The association message might contain one or more TSPEC and one TSRS IE if the client wants to establish the traffic stream as part of the association. Same info included in re-association message if a client roams to another AP. Since this TSPEC info include client minimum physical rate (PHY) that client device will use, it allows the calculation of how much time that station can consume in sending & receiving in this TSPEC, thereby allowing AP to calculate whether it has resource to meet the TSPEC. When TS finishes the STA must send a Delete Traffic Stream (DELTS) to release the CAC resources used for that stream. Here is a wireshark capture of 802.11 wireless frame for client request to AP for ADDTS. (source from 7921 phone to destined to AP). Note that action code is “Setup Request” indicate it is TSPEC request message. Here is the response from AP to 7921 phone. Note that action code is “Setup Response” indicate it is TSPEC response. In the above I have setup my WLAN for platinum QoS profile. Now will see if I change it to Silver & see what happen to these messages when I made a call I from 7921 phone. I am getting Network Busy message & won’t able to initiate a call. Why is this ? As you can see below this time TSPEC request is rejected by AP & therefore client did not get bandwidth resources from AP to make that call. See below two capture for ADDTS request & response in this scenario. You can do “debug cac all enable” on WLC CLI to troubleshoot this. In this scenario you should see something similar to below. 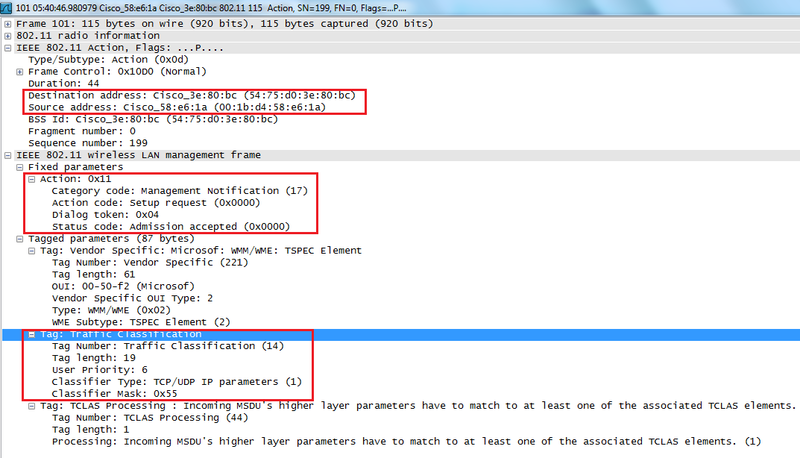 Before a client can send traffic of a certain priority type, it must have requested to do so via the TSPEC mechanism. For example, a WLAN client device wanting to use the Voice (VO) AC must first make a request for use of that AC. 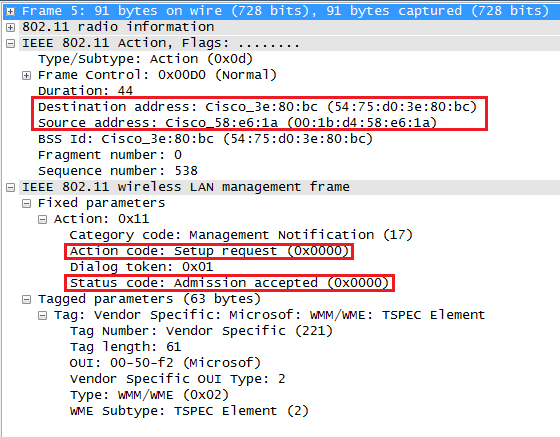 Best- (BE) and Background(BK) ACs can be open for use without a TSPEC request.Therfore if you WLAN is not configured for Platinum Profile AP will not allow resources to VO-AC traffic. If you ever wonder why you can’t make calls while your QoS profile setting is not set to “Platinum” , this TSPEC behavior is the reason for that. Here is the CAC debug output when everything is working (Platinum QoS). Read this CSC forum thread if you need to understand more on TSpec and ACM with different client types and Cisco WLCs. I work with Linux on a 802.11 testbed. But the stations doesn’t send ADDTS Request when I start a video streaming flow in the network. Even if there is no admission control mandatory. I do not have any knowledge about products you mentioned. But in general you have to enable Call Admission Control (in this case I think Video CAC as well) on your AP & client should WMM (or 802.11e) complaint this to work. 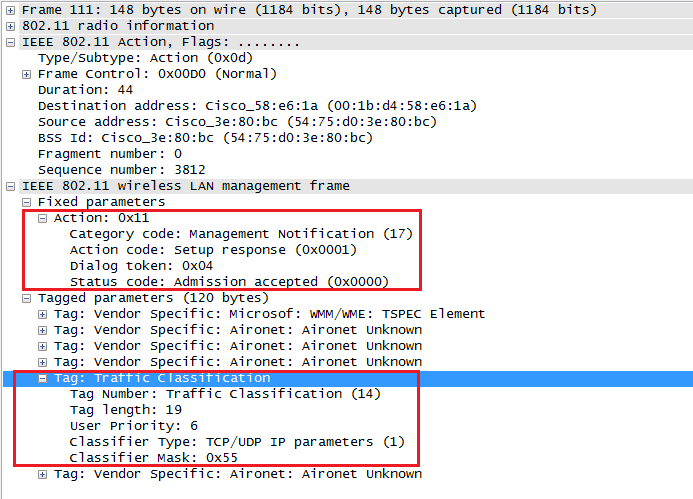 I am giving you the feedback thinking about how it works on Cisco WLC & AP. how do we enforce the clients to send a ADDTS request even though the client is WWM .11e compliant. For e.g. i have windows laptop , running lync.. now i see that the laptop does not send the ADDTS request even though it is compliant. Is there some way to the applications (like lync, skype) to force the driver to send ADDTS request. These application may not correctly classify traffic (Voice, Video, Best Effort, & Background) according to WMM specs. So most of time traffic goes in wireless frame as BE (from client to AP). I haven’t test below, but it looks like in Windows 7 you can do some sort of classification if your application/wireless driver do not support it natively. Thank you for the prompt response. I agree that the applications themselves does not play any role to classify traffic correctly. sure will go through the links to get more info. will keep you posted on my findings. I appreciate the detailed article – thanks for taking the time to share your knowledge!